Forget flying cars and hover-boards. Trans-dimensional portals are the future when it comes to transportation. Yes, just like in Rick and Morty, jumping through trans-dimensional portals may just be all the rage! Why just travel a few miles, when you can head to completely different dimensions? Have you ever traveled to the blender dimension? It’s quite a delightful world of whirling blades! Let’s see. There’s also the Cronenberg world, which is filled with hideous monsters and the Corn Universe, where cobs of corn are sentient beings. And, boy oh boy, you haven’t lived until you’ve been to the Pizza Universe. Unfortunately, it’s not quite the future yet. We can’t all have the portal gun wielded by Rick from the Rick and Morty cartoon series. We do, however, have this great prototype prop of Rick’s infamous gadget. This Rick and Morty Replica Portal Gun perfectly recreates the tech wielded by Rick. 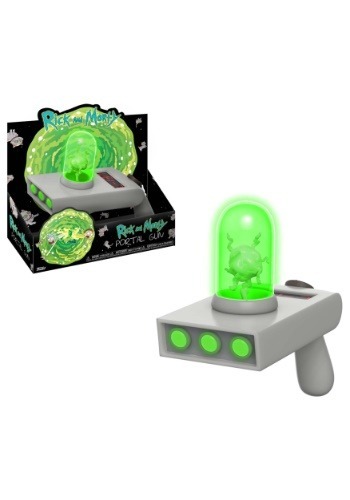 Now, it’s a toy, so it won’t send you to Pizza Universe (sorry), but it does light up when you pull the trigger. It also makes sounds from the Adult Swim show. It even has a “C-137” display on the top, indicating that you’re currently in C-137.